Dane Sampson, 20 years old from Bristol explains how the head office franchise team at FiltaFry Plus have supported him and enabled him to achieve his short-term aims in 2 months! When I wanted the challenge of running my own business I decided that franchising was my best option. I chose to invest in a franchise because I wanted to own a business that already had an established reputation and could give me support if I needed it. 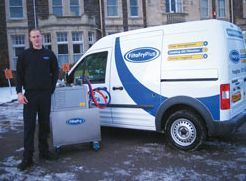 While researching into the franchise opportunities available FiltaFry really stood out because it was such a unique business. Also I felt that it had a good earning potential and would provide the opportunity to expand. My franchise covers the Bristol territory and since launching in September 2009 my round is already half full. I have had no problems in getting customers and I found that the training I did prior to my launch had fully prepared me for the running of my business. The beauty of this franchise is the repeat business week-in, week-out with the same customers and you only need 35 to 40 customers to reach serious earning potential. Within two months I managed to fulfil my short-term aim of having a full round. I am now concentrating on establishing my business and building a good relationship with my customers and in the future I might look at expanding. Although it is more difficult being self-employed the skills I have learned running my franchise will stay with me for life. I feel that, being self-employed, anything is possible and the opportunities are endless. I was only 20 when I took the leap to be my own boss and the support of the FiltaFry head office team has enabled me to develop the skills needed to be a successful business owner. If someone had told me when I left my job that I’d be doing all this for myself within a year, I’d never have believed it!